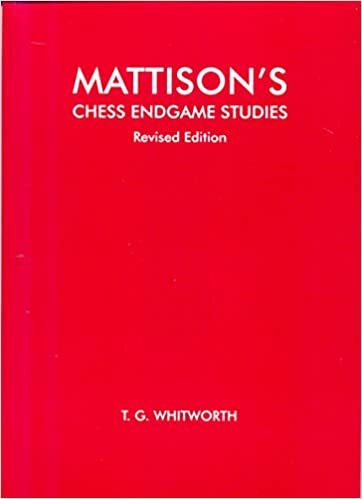 This book contains all 60 of Hermann Mattison’s chess endgame studies alongside comprehensive solutions and commentary, courtesy of T. G. Whitworth. There are pawn endings and positions displaying diverse forms of material imbalance, with a particular favourite it seems being where a lone knight and advanced pawn(s) battle against rook and king (the king’s presence being important because certain key variations will often give the opportunity for a winning fork). Invariably the positions, which could very easily have arisen from practical play, contain some startling resource. Whitworth sums up Mattison’s artistry as a study composer in this way: ‘In the best of his studies he succeeds in conjuring from his slender forces a tense struggle, subtle and double-edged, that is just as intriguing as the denouement itself.’ This is a judgement I would agree with. And as for Whitworth’s commentary, I found it to be sometimes unobtrusive – content to let the study speak for itself – yet unfailingly perspicacious and insightful. In addition to the studies, 7 of Mattison’s games (without notes) are included, each accompanied by a diagram. He defeated Alekhine, Rubinstein and Colle (this latter game winning a brilliancy prize at Carlsbad 1929), so could compete with the best. One gets a clear impression of an active and attacking player, a dangerous opponent. Hermann Mattison died young (1894-1932), succumbing to tuberculosis at 37.